It takes a lot of clams to run a professional baseball team. And without the attention of marquee players’ names or stadiums in big cities, it can be a challenge for minor league or independent baseball teams to get fans into the stands. So, about 15 years ago, team owners started to turn to “wacky” team names to woo potential ticket holders. As “farm leagues,” some teams selected local agricultural output for team names, which is why you’ll find the Edenton Steamers, a team named after steamed clams, playing the Holly Springs Salamanders this summer. It’s a great nod to North Carolina’s food culture, and you don’t run the risk of naming your team something kind of racist. 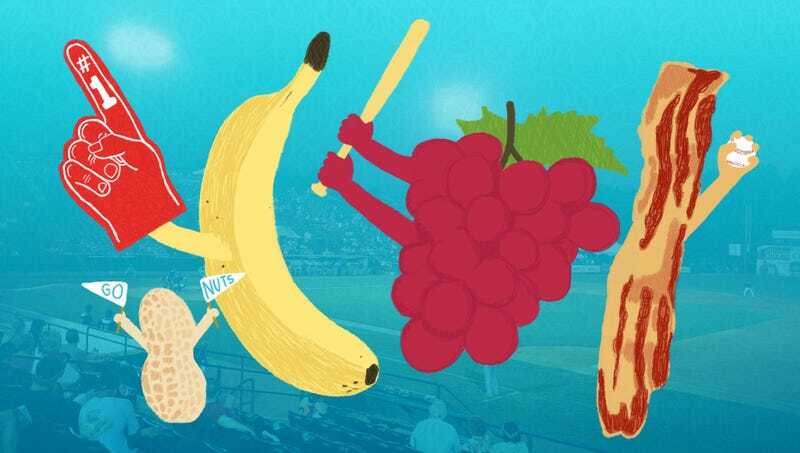 So here are eight minor league and independent baseball teams with lip smackin’ mascots that owe a lot to their home base’s agricultural gems and food traditions. As one of the first MiLB teams to embrace a non-traditional name, the Biscuits have gone all in on game days—the Biscuit Bunch runs around the field with a biscuit cannon, shooting the quintessential Southern snack into the stands while concessions carts hock biscuit sandwiches and biscuits and gravy. The team is cheered on by an anthropomorphic biscuit named Monty (an emotional biopic made it to YouTube) and a biscuit-loving monster named Big Mo. According to the Biscuits’ front office, however, Big Mo was recently put on a one-biscuit-a-day diet in partnership with Scale Back Alabama, a statewide initiative dedicated to getting Alabamans to eat healthier and exercise smarter. While the people of Georgia do love their pork—swine has been in the state since Spanish explorers came to the area in the 1600s—the name of the newest team in the Coastal Plain League was born from a much more 21st-century approach: the online voting contest. Perhaps relieved that a community vote didn’t leave them with a team named Basebally McBaseballface, the Bacon front office also asked the people to name the team mascot (obviously, a personified slice of bacon). In the end, the people decided to name him… Kevin. With Bacon-mania kicking off on June 1, the city, which lies in the center of the state and is known as the Heart Of Georgia, may have to watch its cholesterol—according to the team’s spokesperson, fans can expect an array of bacon-centric concessions. Georgia isn’t really known for its banana production—a majority of American bananas are grown in Hawaii and Florida, and the ones you eat come probably from Central America—but with a name as snappy and a-peeling (sorry) as the Savannah Bananas, it’s easy to root for the fruit. Their biggest rival in the Coastal Plain League? You guessed it: the Macon Bacon. The two teams will face each other 16 times in the 2018 season, with the winner of the series earning a 10-foot tall trophy called the Golden Spork. Named after the stalwart ballpark snack and the city’s native not-a-sandwich, the Chicago Dogs are set to make their debut later this spring. The team launched with a meet-and-greet at one of Chicago’s most famous hot dog stands, The Wieners Circle, with an army of cheerleaders outfitted as encased meat. True to a Chicagoan’s conviction on hot dog toppings, Kevin Sullivan, the Dogs’ announcer and top dog of in-game entertainment, says the team has a strict “No Ketchup” policy—any player caught putting ketchup on a hot dog won’t be just benched, but cut from the team entirely. The Chicago Dogs will face the Kansas City T-Bones during interleague play. From Sacramento to San Diego, the taco is one of California’s iconic foods—and on every Tuesday home game since 2016, the Fresno Grizzlies turn themselves into the Fresno Tacos in celebration of that holy holiday called Taco Tuesday. A two-day taco truck showdown hosted by the team has also become one of the city’s biggest summer events, with more than 30 taco trucks rolling into town to earn the title of best taco. Behind Washington and Idaho, Oregon is the third-largest hop producing state in the nation—and Portland boasts the largest number of breweries in a single city. So it’s no surprise that its suburban Minor League baseball team celebrates the area’s booming agricultural and economic outputs. As such, the team is cheered on by a hop cone inexplicably named Barley (Fuggle would’ve been a more appropriate and cute choice), while promotional nights have featured a stein giveaway (to 21+ fans, natch) as well as mini beer festivals featuring more than a dozen local breweries. Portland-based brewery BridgePort makes an exclusive beer for the team—and American blonde ale called Long Ball—which can be found on tap in the park and at BridgePort’s brewpub during the season. Last year, California declared the almond, the walnut, the pistachio, and the pecan to be the state’s official nuts. Soon after, botanists “well, actually’d” the California lawmakers for making four seeds the states nuts, but that’s no matter to Modesto’s minor league baseball team, which employs Al The Almond, Wally The Walnut, and Shelley The Pistachio as the team’s mascots. For this year’s baseball season, nuts are back in a big way in California—after a years’ long drought affected its $21 billion almond industry, there are now record harvests in the state. The team is also nuts about all its fans, even the ones who can’t enjoy Cracker Jack—throughout the season, they host several Peanut-Free Nights, where fans are educated about nut allergies and in-park sales of peanuts are temporarily suspended. Named after the traditional Mardi Gras sweet, the New Orleans Baby Cakes bring NOLA’s heralded food culture into the stands. In addition to game staples like hot dogs and nachos, the concessions at the Baby Cakes’ home at the Shrine on Airline include po’ boys, gumbo, rice and beans, and jambalaya. And if you really want to let the good times roll, you can rent a hot tub located in right field, with a great view of the game.